Happy Friday y'all!! It's a great day to be sharing some inspiration, don't you think? And what better way than with some Power Poppy images! I even pulled a "Cindy Lawrence" and finished off the inside of my card. She always goes above and beyond, and since I admire her so much, I thought it was about time I did too. Besides, I loved the sentiment "Bring it On" and wanted to use it with this color scheme...like you're saying..."Turning 50?...Bring it On"!!!! Lastly, I added some Chrome Pearl Pen dots to my cake to make them look like edible candy additions. Thanks for dropping by today! I hope you have a most fantastic weekend!! Hello friends!! It's Friday!! Already!! Oh my goodness how this day can sneak up on a person. I'm not complaining though, because I am so ready for the weekend!! And how!! 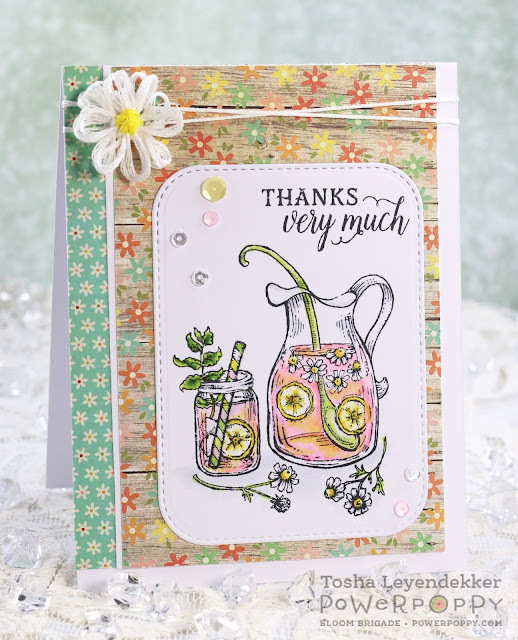 It's been a bit hot here lately, so I thought this darling little pitcher of refreshment, with an accompanied mason jar, was the perfect image to work with this week!! It's from the charming Power Poppy Clear Stamp set called Tea in the Garden. I decided it was going to be pink lemonade for today, and colored it accordingly with some Copics, diecut it with the Stitched Rounded Rectangle die (Die-namics), added some sequins (Pretty Pink Posh), and a charming little daisy that I made using some embroidery thread and a Clover Mini-loom. This was quite the CAS card for me...which at times can be harder for me than a really involved card. But this one came together sweetly...especially once I found the paper I wanted to use with it. 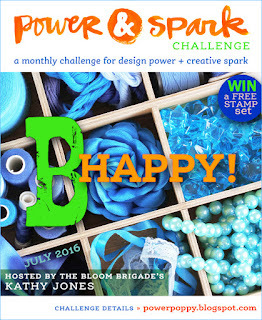 And also, there's still time to participate in our Power and Spark challenge this month. Shoot...why not!!! You could win some free images!! 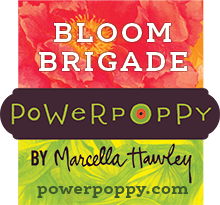 Just head on over to the Power Poppy blog for all the details. Really, all you have to do is create a project with the Power and Spark challenge and link it at the bottom of the blog post found Here. It's super easy! Thank you so much for dropping by! I hope you are enjoying a delightful Friday, and that your weekend is nice and relaxing! Hello, hello, HELLO!!! This is quite the inspiration filled Friday, let me tell ya!! 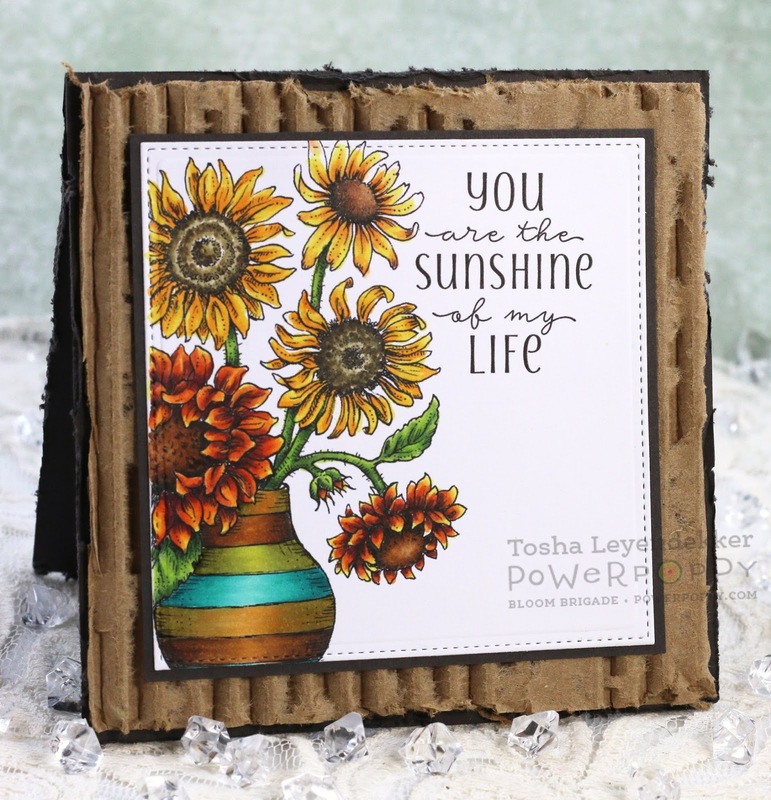 The Instant Gardeners, as well as some of Bloom Brigade members, are sharing a gorgeous new Power Poppy Digital image called Sunshine of my life!! And it's a beauty!! 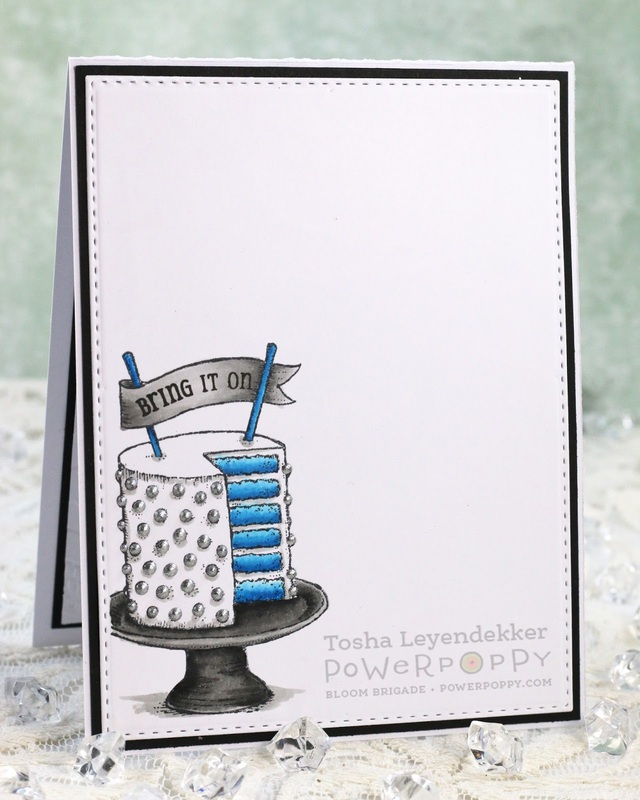 I also have a second card to share with you using the Power Poppy Digital image Sweet Simple Things. There's a lot of color flowing today. I took an easy way out with this card a bit. Jennifer Dove has fabulous "Color of the Day" tags, and since I knew I wanted to use a variety of colors on the vase and flowers, I thought I'd use her already designed combinations. The Vase uses Split Pea Soup, Gopher, Chartreuse, Patina, then Split Pea Soup and Gopher again. The Patina was used on the next stripe too, but it got mostly cut off. I used Transition Red for the two bottom sunflowers and my own color combination for the other three. I also used her Dragon combination for the leaves and stems. That's it for my first card. For my second, I colored the Digital Image Sweet Simple Things. I adore Bee Skeps and have quite a collection, so of course I had to color this baby up as soon as I had the chance. Didn't Marcy design the most charming image? Seriously!! I LOVE this, and had a delightful time coloring it. I wanted the Bee Skep to have as much dimension as I could achieve, so I colored each individual layer. The sentiment is from one of the new Clear Stamp sets called Everything's Even Rosier. I love how Marcy scripted the word "hello". I'm so glad you were able to drop by! I hope you enjoy a fabulous weekend!! Hello friends!! It's been awhile since I've posted. Sorry about that, but I've had a bit of family visiting from out of state, and to me, family always comes first. Now though, it's back to creating. 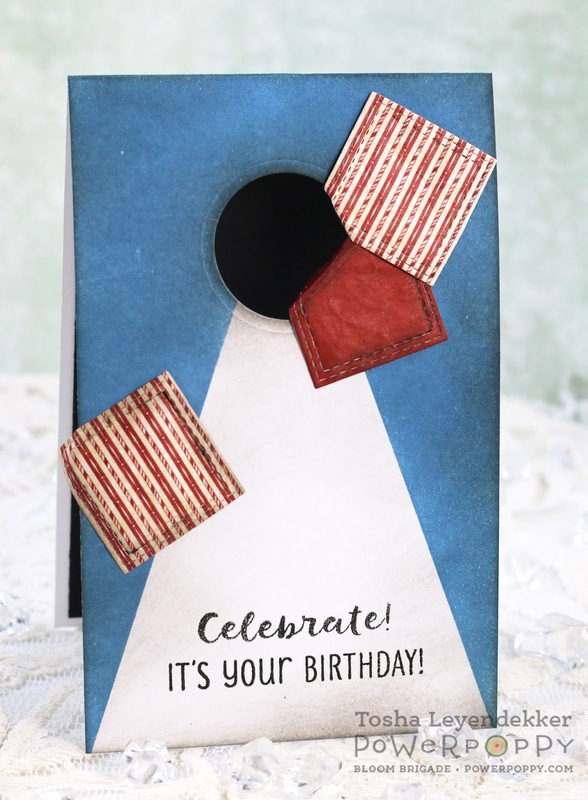 So, I thought it would be fun to design a Corn Hole board for a card. All I did was make a 3 1/4" x 5 1/2" single layer card. 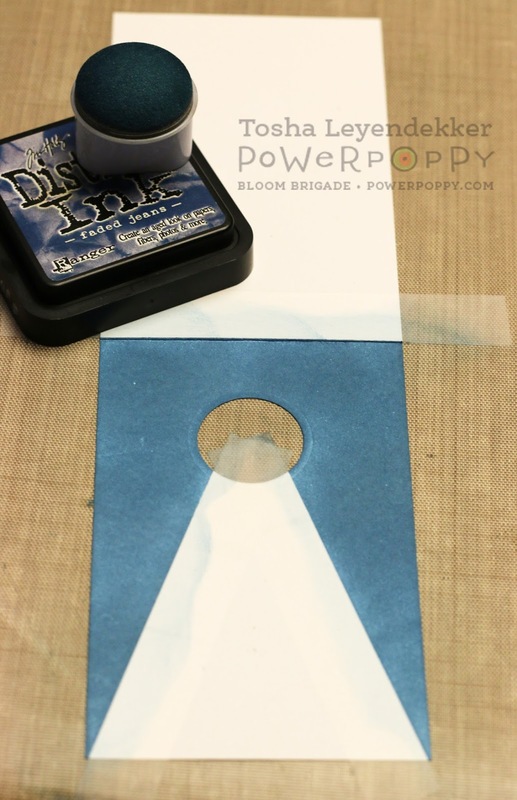 I diecut a circle toward the top and taped off a triangle shape using some removable tape. I then added some Faded Jeans Ranger Distress Ink to the outside of the card leaving a white triangle for the sentiment. The sentiments are from the Power Poppy set Party Time. They fit perfectly!! I also diecut 3 Double Stitched Squares (Die-Namics) to use for the bean bags and burnished the back of them to give them a worn look. Lastly, I added some Pumice Stone Ranger Distress Ink to the bags and board to give them a well used look, because, lets face it...our equipment is well used. oops...almost forgot...I added a black base to the back to make the hole in the front more prominent. That's it. Easy-Peasy. Oh...and I should mention...the reason for the colors is because he's a New England Patriots fan. My husband wasn't a fan of the card because of that...being a 49ers fan himself. Yikes. The things we do for family. I tell ya!! Thanks for stopping by!! Be sure to drop by on Friday. I will have another fabulous Power Poppy image to share with you. It's Bee-yond adorable! !